The Shorty Awards are Twitter's equivalent of the Oscars. (CNN) -- In the thick of awards season, there is at least one prize ceremony where the speeches are guaranteed not to over run -- the Twitter Oscars. Momentum is building for the second annual ceremony, known as the Shorty Awards, which celebrate outstanding use of the popular site that restricts users to a strict maximum of 140 characters. But while last year's -- hosted by CNN's Rick Sanchez -- saw somewhat frivolous use of the micro-blogging service championed, 2010 is expected to give more significant recognition to the role it has played in helping the earthquake-stricken people of Haiti. With public nominations for the Shorties currently open ahead of the March ceremony, support is gathering behind organizations and individuals which have utilized Twitter to highlight issues in Haiti and speed aid and assistance. Among them is Haiti resident and TV presenter Carel Pedre, who has so far received a total of 163 nominations in five categories for a Twitter site that has become a virtual clearing house for aid agencies and those seeking urgent help. Pedre's efforts have seen him climb to the number five slot in the #innovation category, where he is the standout candidate alongside a handful of social networking experts and Betty Draper, the fictional dysfunctional housewife from television series "Mad Men." Fictional stars, particularly those from "Mad Men" are no stranger to the Shorty Awards. Peggy Olsen, the show's sociopath secretary-turned-copywriter, was one of the standout winners in 2009, triumphing in the #advertising category. But with sponsorship from the prestigious Knight Foundation, which promotes excellence in journalism, and categories including news, government, education and art, they have a serious edge. 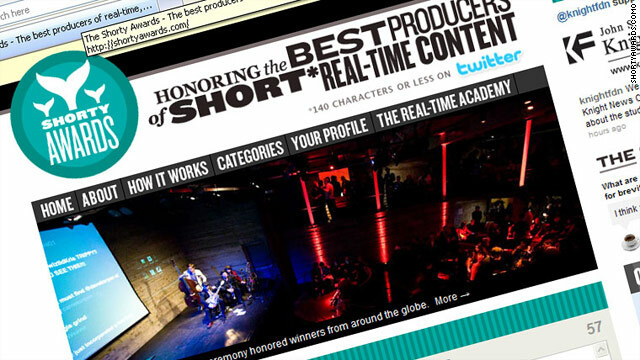 "The Shorty Awards honor the best people and organizations on Twitter. These unique awards are for the Twitter community, by the Twitter community." the scheme's Web site declares. Anyone with an active public Twitter account can nominate, vote and campaign for users, but the most popular nominees in each category must pass scrutiny by the Real-Time Academy of Short Form Arts & Sciences. The newly-formed body, which includes MIT Media Lab's director Frank Moss, "Charmed" star Alyssa Milano and entertainer MC Hammer, will select who goes forward to the New York award ceremony in March.